That first trip to Australia, I took a day tour along part of the Great Ocean Road, getting as far as the small town of Lorne. If that’s as far as you can go, I think it’s still worthwhile, as the entire coast is splendid. However, even on that first visit, I found myself wishing that I’d be able to return to take that road farther. On my second trip to Australia, I made that wish come true—though I approached from the opposite end. I rented a car in Adelaide and, after making my way through the lovely Grampian Mountains, I headed down to the coast at Port Fairy, a charming fishing town where I found a handsome little bed and breakfast to spend the night. Next day, I headed east along the Great Ocean Road. This stretch of oceanfront property is often called the Shipwreck Coast, and my first stop was at the Flagstaff Hill Maritime Village in Warrnambool, where, amidst wonderful old buildings, rusting anchors, and lighthouses, I learned about the coast’s history and perused many of the items salvaged from some of the hundreds of ships sunk nearby. On the road again, I began to see the splendid, sea-carved cliffs, rock formations, and stunning sea views that had actually lured me to this coast. A brisk wind kept the weather changing throughout the day, and made everything seem even more dramatic, with varied cloudscapes and often white-capped waves. I parked the car often, to get out and explore, scrambling down to the water’s edge whenever there were stairs or a designated place to climb, walking along cliff edges when there was no way down. I was captivated by the parade of remarkable formations: the Bay of Islands, the Grotto, Lock Ard Gorge, London Arch, the Blow Hole, and, most famously, the Twelve Apostles, all carved by wind and waves. The coast itself is wildly sculpted, and it is easy to imagine some of today’s coastal walks being transformed in time to new arches and standing stones. 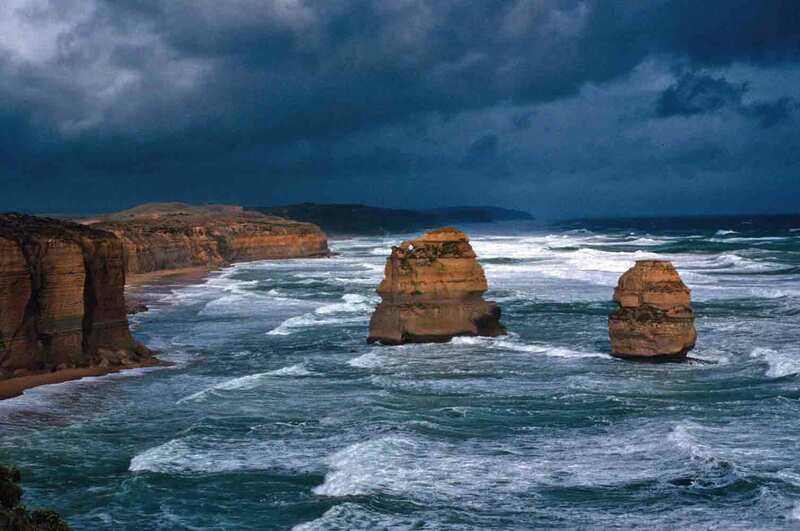 The photo below shows two of the group of stone towers known as the Twelve Apostles, which are within the protective borders of the Port Campbell National Park. While staying in Melbourne, I caught a tour down to see the large penguin colony on Phillip Island. I actually wrote about this, and included an excerpt from my book about the penguins coming ashore, back in June 17, 2007, when the blog was still fairly new. (However, if you missed the earlier post, you can see it here.) 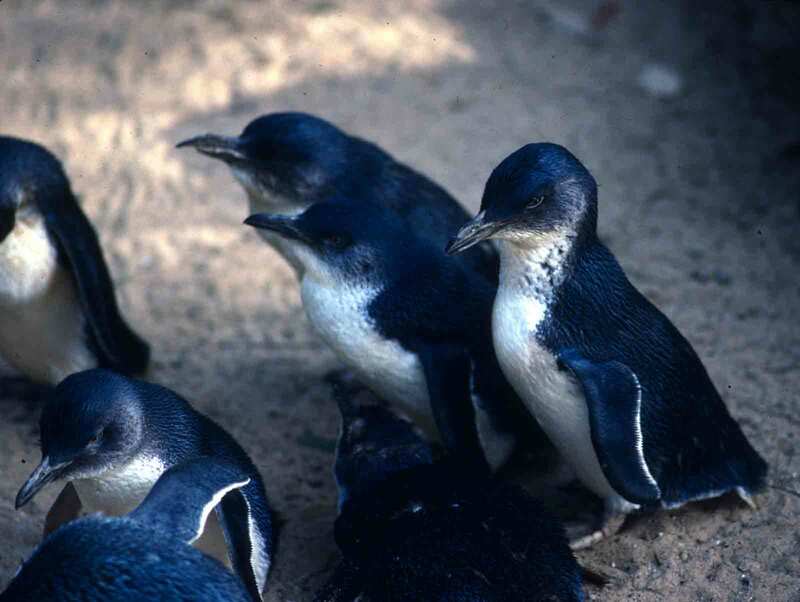 Because penguins were pretty well covered, I thought I’d talk a bit about some of the other Australian birds I love—these ones for their songs or calls. The links will take you to videos where you can hear these wonderful creatures. Kookaburras are the largest members of the kingfisher family (they can reach lengths of 17 inches). They are also the fastest kingfishers, are very territorial, and mate for life. While there are birds in Australia with lovelier songs, there are no others that can so easily put a smile on my face. Whole families of kookaburras greet the day with everything from raucous laughter to quiet chuckles—and it is almost impossible not to join in. Australian magpies are handsome, crow-sized birds with pure white markings splashed across jet black feathers. They are bold and can be comical, but are most appreciated for their lovely caroling. My visit to the Dandenongs was not the first or only time I heard the whipbird, but I did hear it a lot as I wandered amid the tree ferns and mountain ash in these mountains outside Melbourne. Unlike the kookaburras and magpies, whipbirds are rather shy. So while they are often heard, they are rarely seen. It is their call, like the whistling of a whip being swung, that gives these birds their names. The long “whip” sound is actually only made by the male. You often just hear that sound, but if there is a little “tweet tweet” immediately following it, that is the female responding. The video reached by this link is not of good visual quality, but it offers a good recording of the male whipbird. There were only a few times I was in a forest where I was surrounded by bellbirds, but they were remarkable times, with the ethereal, crystalline ringing sound of the birds stopping me in my tracks. The lyrebird is named for its tail plumes, which, when erect, look like the outline of a Grecian lyre. The male is a master mimic. In this excerpt from David Attenborough’s series on birds, you will recognize several of the bird songs identified above, as well as surprisingly good imitations of some human devices, from a camera’s motor drive to a car alarm to a saw. After a few days in the city, I had the pleasure of heading into the nearby mountains—the Dandenongs. I was delighted to find myself surrounded by greenery. 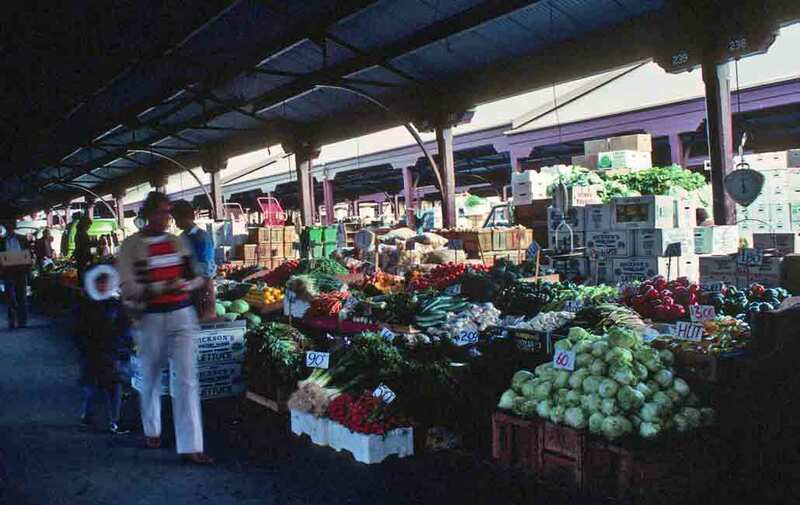 It is a lovely feature of Australia’s largest city’s that there are mountains and wilder, or at least more rural, areas quite close at hand, where one can escape to cool beauty. The Dandenongs are home to the Australian mountain ash, an impressive eucalypt that can attain heights of 300 feet. Beneath the tall trees, the ground is blanketed in ferns—although I guess one can’t actually say the tree ferns were blanketing the ground. These odd, ancient ferns actually tower over those ferns that do stay at ground level. If the tree fern below reminds you of pictures you’ve seen of the age of dinosaurs, there’s a good reason. The fossil record shows that the types of tree ferns found in Australia were quite common during the Jurassic Period—and earlier. Of the three genera of tree ferns, one clings to the hot, humid forests that follow the equator, from Southeast Asia to Mexico. But the other two have a far wider range, with several species that are quite comfortable in cooler climates or in mature forests at higher altitudes. 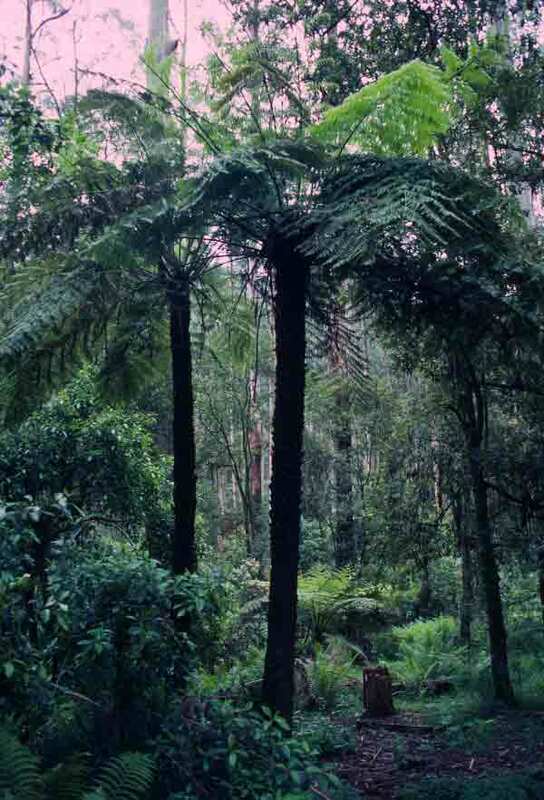 Here, amid the towering eucalypts, the tree ferns (which can get to an impressively tree-like height of 80 feet) tower above the shorter ferns, adding a middle level to the general greenery, making the forest seem even greener.